Many contemporary apartment blocks can end up being much of a much-ness in terms of design. And that is exactly why the properties in Leeds Concord Street are so refreshingly different. 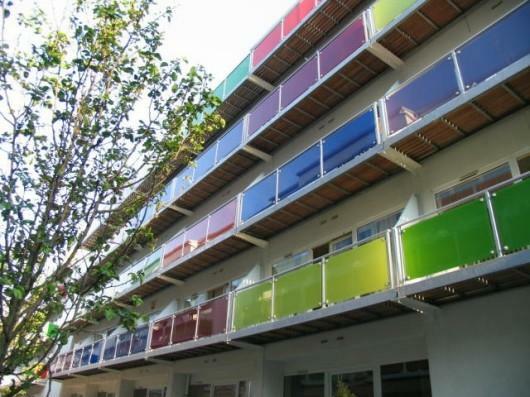 It is unusual to find such a bold use of colour in a modern development and this is the first thing you will notice about the apartments in Concord Street. The glass balconies on these street-long twin blocks really do manage to brighten-up the dreariest of English days And there are precious few modern British properties which you can say that about. But not only are these apartments roomy and attractive they are also located right in the centre of Leeds Northern Quarter. This part of the city has undergone a serious amount of regeneration making it a very sought-after and desirable place to live. All in all the apartments in Concord Street offer their tenants comfort and a welcome change to the norm.